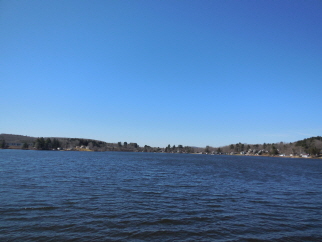 FANTASTIC WATERFRONT ON LAKE WICKABOAG!! Lovely renovated gem on Lake Wickaboag in historic West Brookfield! This charming year round cottage is everything you have been searching for in a lake house. 50' of waterfront includes 2 docks, a stone patio and composite sun deck. New custom kitchen with granite counters, custom bath with pebble floor glass shower, handsome wood burning fireplace and sweet walk-up attic that sleeps 4. Only 20 minutes from the MA Pike in Sturbridge or Palmer, all you need is your toothbrush and a cocktail! Updates include new kitchen with granite counters, new tiled bath with glass shower, new wood burning fireplace, new wood floors, insulation, carpeting and Pella windows! Beautiful stone patio, composite sun deck and 2 docks (16' and 32')! One car under garage with plenty of storage and a sweet workbench!